The stout, happy woman who greets me at Waikiki Hawaiian Grill is always in a good mood, which puts in me in a good mood. But her cheer and friendly demeanor isn't the only thing that keeps me loyal to this Tustin eatery: it's the food produced by her husband. In the kitchen, this square-jawed Korean man in a baseball cap commands a crew of two hard-working Latinos. Working just as feverishly as his employees, his face seems forever flustered, like a marathon runner on his final mile. But as a driven perfectionist, I often see him doting over a styrofoam container of loco moco as if he were being judged on Top Chef. With determined concentration and an intensity of purpose, he ladles just the right amount of gravy, and scoops the roundest, most perfect hemispheres of rice. Outside, in the dining room, where the tables gleam like polished surfboards, the only CD they own -- Israel Kamakawiwo'ole's "Facing Future" -- loops continuously, piped in through tiny speakers. IZ's creamy voice and the pluck of his ukelele bounces around the walls of the spotless, cheerful room, and in your head for eternity. The last track you hear is the one you'll be humming for hours. But what better than the best Hawaiian music to accompany the best Hawaiian food, like Waikiki's Loco Moco ($5.99) -- the finest I've had anywhere. It's a rich, hearty dish that begins with a foundation of rice, and continues with two ground beef patties, two sunny-side up eggs, all drenched in a salty, brown gravy made from scratch. As any loco moco maven will attest, what makes or breaks a loco moco is its two principal components: the beef and the gravy. It only takes an unseasoned patty or an insipid gravy to tip the balance from a heavenly loco moco to one that will make you sick from nausea. Not here. The beef is salted perfectly, and the gravy elevates the meat in a way that gravy always should. In fact, the last time I ordered the loco moco, I found myself sopping up every last drop with what was left of the rice. My favorite item to come out of his kitchen, however, is the Chicken Katsu ($5.99), which amply feeds two with leftovers for the weekend. Served with a scoop of rice and a mayonnaisey mac salad, it is simply the most divine katsu to ever grace any plate, styrofoam or otherwise. The secret of its success is three-fold. First, the crust. Through what must be some sort of bizarre alchemy, the crackly integrity of the breaded shell remains greaseless and fully in tact, even after a thirty minute travel time to my door. Possessing a crunch heartier than a thousand Saltines, you won't find a soggy piece in the pile. Every strip of the breading is as sturdy as it is flavorful, with a faint buttery sweetness hiding inside each Panko crumb. Secondly, the meat is cooked to just the right degree of moistness -- not slobbery (underdone) or dry (overdone). It's a happy middle which will please both white-meat and dark-meat connoisseurs. Last, but not least, is the sauce, which is pitch-perfect and well-balanced in every sense. Served in small plastic containers, it has the tangy fruityness of pineapple juice which is softened by sugar and then sharpened by chili. The woman, who knows I love the stuff, packs away two servings for me without having to ask. When I'm hankering for fried rice, the kitchen chief also cooks a mean version called appropriately enough, Hawaiian Fried Rice ($6.49), with loose, toothsome grains, stir-fried in a wok until it attains the ruddish color of paella. He doesn't skimp on the proteins either. Included in the dish are meaty strips of their BBQ chicken, and three fat shrimp along with some juicy chunks of pineapple. Another dish I tried recently was Garlic Shrimp ($7.99), which resembles the Chinese restaurant staple, "Salt and Pepper Shrimp", but served on top of wilted cabbage. An order comes with rice and mac salad, with a dozen of the plump crustaceans lightly floured, deep fried, and then wok-tossed in an aromatic mix of minced garlic and chopped scallions. If you get it as take-out, it will stink up your car, your house, your breath, and still leave you begging for more. Of course, since I'm mentioning everything I like about the place, let's not forget about their Hawaiian BBQ plate lunches, which I've reviewed previously on this blog. It's still formidable, gut-busting, and delectable. And no I haven't forgotten about the Spam Musubi ($2.69 for 2). It's SPAM-tastic! Nice! and Spam musubi are yummy! 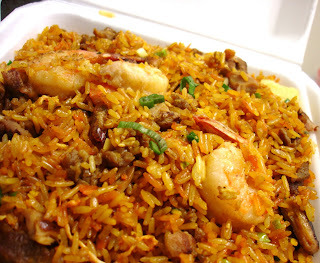 The paella-like fried rice sounds good too. how's it compare to L&Ls? Hawaiian barbecue is my new reason for living. 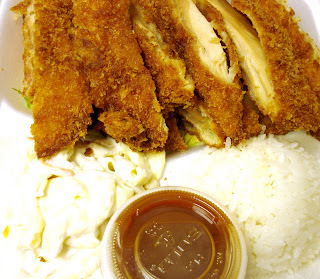 My favorite is the chicken katsu drowning in gravy from L&L. I'll give this place a try, though, that garlic shrimp looks awesome. 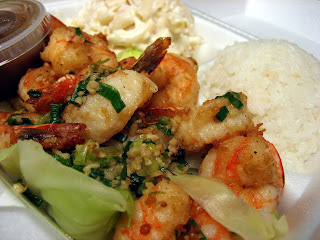 The Garlic Shrimp is my all time favorite, but I frequent the Waikiki Grill on Tustin Ave and Meats in Orange. Oh, my two favorites: loco moco -and- chicken katsu with mac salad. Hey Elmo - where's the photo of the loco moco? And do they still only give you one scoop rice? Everything looks delicious; you know, there's nothing better than Hawaiin mac salad, I usually hate mayo but if it's the Hawaiian style mac salad, it's just so delicious, what is it that makes it so good. I didn't know you watched Top Chef either, were you as dissappointed as I was with the winner? I mean c'mon, Marcel all the way. Thanks for blessing us with another wonderful post. I could say the same thing about you as you say about Waikiki: 1) reading Monster Munching puts me in a good mood, 2) you are a driven perfectionist when it comes to immaculately written posts, 3) the last sentence I read on your post will have me desiring whatever food you ate (also for hours), 4) you give me the equivalent of two posts and I don't even need to ask, and 5) you leave me begging for more! For a small portion it serve about 2 people and for a large portion it serve about 3 people. Talk about a lot of food for the bucks! What's funny is that I have all the ingredients to make my own homemade Spam Musubi in my pantry, yet I still prefer to just buy them from Waikiki! My humble opinion is that Waikiki Hawaiian Grill is the *BEST* Hawaiian place I've ever had the pleasure of trying. I think it even tops all of the plate lunch places I ate in Hawaii itself, which included L&L actually. But hey, this is just one guy's opinion. The Garlic Shrimp was beautiful. It's a little steep since you don't get that much (compared to the quantity of katsu), but still frickin' great! I've heard that the one in Orange is equally good. A co-worker of mine frequents that one, and we compare notes. It sounds virtually identical. Those two has to be my faves too. There's always room for Spam Musubi though. Ahhh, the loco moco pic went untaken, since I ate it during a trip I didn't have the camera. Next time I get a craving, I'm going to make sure to have my camera primed. And yep, they still don't give out enough rice. For the katsu, the rice is done before we've barely made a dent on the chicken. But nowadays, knowing this, I just have my own rice ready at home. I recently got hooked on Top Chef last season (it was hard to avoid anyway since they have marathons all the time). Actually, my favorite was Sam, although he was really stoic. Aaaw! Thanks! You always leave the funniest and most thoughtful comments. I'm tickled! Tell me about it. I wonder why there aren't more fat Hawaiians! How is it that you can make me hungry for cuisine I've never even tasted? Maybe it is because you write so well. Or maybe it's because it sounds similar to foods I have eaten before. I don't remember if I ever left you a comment similar to this in the past. You'll have to excuse me. Pregnancy shrinks the brain, you know. Thanks for the kind compliment! Though Hawaiian food is indeed an amalgam of familiar components from other cuisine. You've got to try it out when you have a chance, and if the little boy growing in your belly craves it! 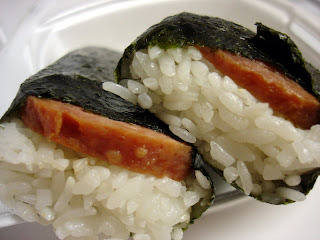 Spam musubi is one the greatest inventions to come out Hawaii since the surfboard. Sounds fantastic--I usually don't like katsu since most of the katsu I've had is usually like breaded cardboard but I'm always willing to give it a try. Do they have pork katsu also? For Hawaiian food out here, the best place I've found is Matiki Island BBQ--the kalua pork and cabbage is great, but only available on weekends. yess!!! katsu is my favorite hawaiian dish! 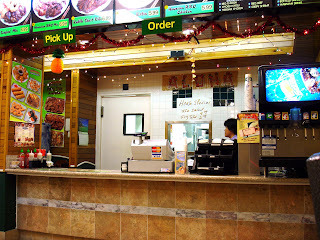 i usually go to Ono though just because it's closeby. 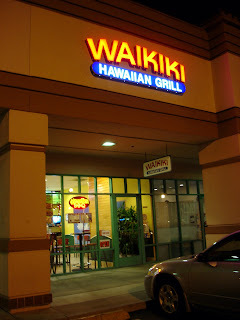 However, there is another Waikiki hawaiian grill in alhambra. I wonder if it's the same chain. "Ruddy" fried rice, nice description Elmo, I am getting very hungry looking at the photo. If you are ever up in the Monrovia area you might try the Yang Chow fried rice at Wang's Palace: chicken, shrimp, bbq'd pork *AND* scallops! I love loco moco, but I haven't been able to find a really good one. i think I'm going to have to pack my titanium spork and head over to Tustin. You seem to be finding some real gems over there. Hmm, Anaheim! So many suggestions around that area. Shoot me an e-mail and let me know what kind of food you're looking to try. One quick suggestion is Boiling Crab in Garden Grove. It's Lousiana Crawfish done up by Vietnamese. I bet there's nothing like it in Hawaii! What's funny is that after eating some chicken katsu in the Big Island, I became homesick for these, in Tustin of all places! Unfortunately, it's all chicken katsu at Waikiki. Matiki sounds great...Waikiki also has kalua pork, but that chicken katsu always is a hard habit to break. According to their website, they have three locations but none in Alhambra. But I guess it's a pretty generic name. Hey ChinoWayne, almost didn't recognize you! That Yang Chow Fried Rice actually sounds good enough for me to go up to Monrovia! Sign me up. I'll have to look up Wang's Palace. Your titanium spork will be well rewarded as will your Panda stomach! Ditto. I'd live there...if only! My co-workers and I thought this was basically an L&L - nothing special. They didn't even have lemon or lime for water. WARNING...DO NOT EAT THERE!!!! They served me "used" food!! As I waitied for my to go order, I saw the owner serve another guest and then at least 1 minute later she came running up to guest, swiped the plate from under his fork and told him it was the wrong one. She then closed the take out plate, put it in a plastic bag and tried to give it to me telling me that "oh, he no touch food"...Right, so you're telling me the guy just sat there and stared at the plate for a good 60 seconds and didn't touch a thing. So she goes in the back complaining in her native language and comes out a minute later with a "new" plate. So if you like food that has already been picked through by someone else...Dig in! I'D LIKE TO SAY THIS PLACE WAS AWESOME JUST LIKE L & L BACK HOME IN HAWAII. I WAS SURPRISE THERE WAS SUCH A PLACE TO EAT. MY KIDS & I WAS TIRED OF FRIES, AND POTATO. GOT A CHANCE TO EAT THE B-B-Q MIX PLATE. AND THE KALUA PIG WITH CABBAGE. I'D LIKE TO SAY THANK YOU TO THE OWNERS. I WILL MAKE SURE WE WILL VISIT AGAIN IN THE FUTURE. Love your reviews... you really know food! Here's a tip: if you like Waikiki, try Ono Ono Hawaiian Kitchen on 17th (off the 55 in Tustin). It is unbelievable. I especially like the Poke chips, spicy BBQ pork, and their potato/mac salad is mouth-watering. As a bonus, there is Mulan Kitchen right next door, which serves Pinoy food and has your favorite-- silogs! Check out both places... but if you only have time for one, Ono Ono is the one you should try. Wow! Another silog place in Tustin? I looked it up and saw that Mulan Express is a Chinese take-out. I presume the silogs are off-menu? And if so, do they only have it some of the time? The owners of Mulan Express are Pinoy (I think they took over recently, since I never noticed Pinoy food in there until only a couple of months ago).